This week I thought, why not be different. Why not do something out of the ordinary! 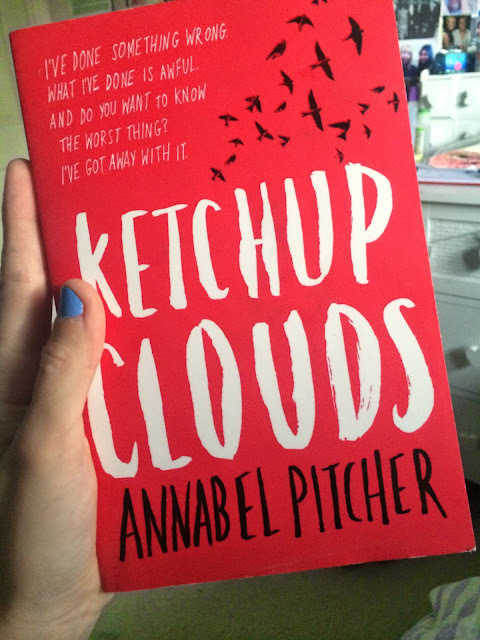 So I decided to do a short book review on ketchup clouds!.... Here goes! The ketchup clouds has nothing to do with ketchup! It actually symbolises blood. It is about a teen girl who had a dark secret and can't pluck up the courage to tell anyone. However when she finds that she can write to prisoners on death row, without receiving a reply she takes the chance using it to help get the guilt of her shoulders. Still not knowing her name as the reader, she writes to the prisoner explaining her situation, creating a fake address and name... The story is in reverse, telling the story as it happens, until it's time for the man to be executed.. Now she tries to prove that he is innocent, studying and learning all about the man, will she make it in time to help stop him being killed? I really would recommend this book to both genders because I think it is really interesting and you never want to put it down! 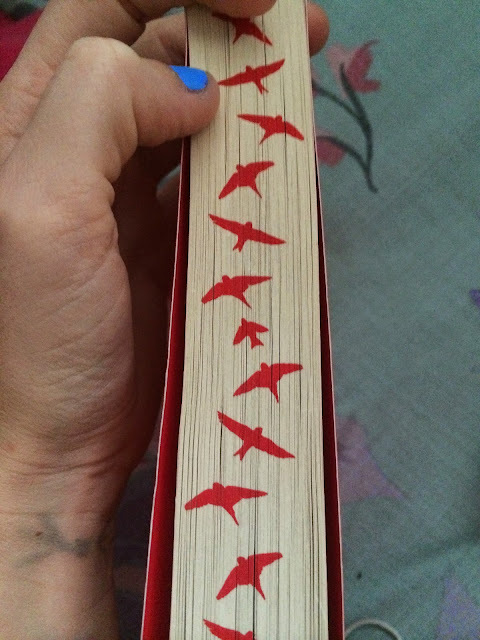 This is the front cover and it is really cute, because the birds then lead onto the pages! 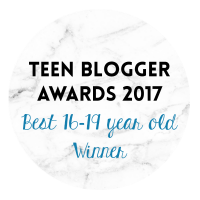 I hope you guys liked this, and will go and read this book, or try out audible! I would give this book 9/10! So this week I decided to do another food kind of topic related tutorial, because everyone loves food lets face it! However if you hadn't guessed by the title clearly something is going to go wrong because I completely messed these up, and I think they look nothing like sausage tools, so I advise you to use something to make them and not my tutorial! If you know where I went wrong, because I don't, please leave a comment at the bottom and tell me, because I want to make these again, but better! 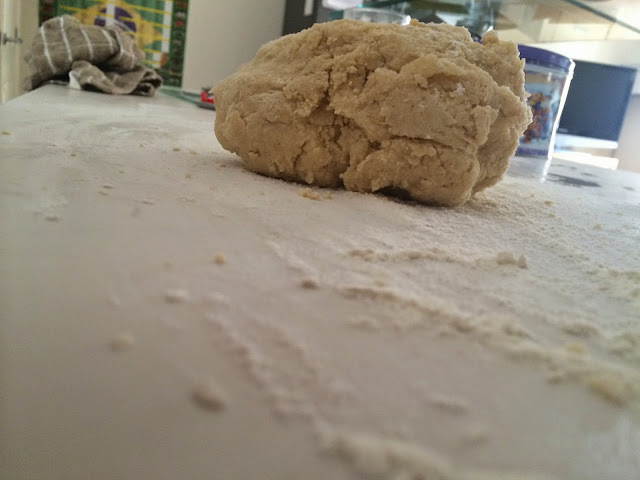 1) Firstly, start by rubbing the butter into the flour. Use only your finger tips because the palm of your hand gets hot and this will cause the butter to melt and you don't want this! 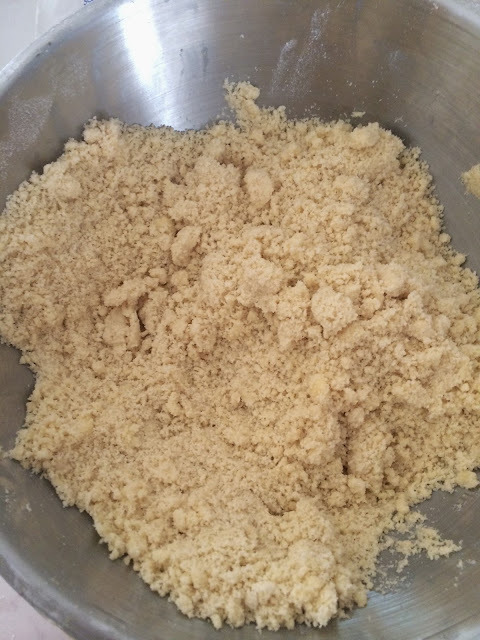 2) Once the mixture looks like it has formed bread crumbs, add 3/4 tbsp of water and mix the pastry into a ball. 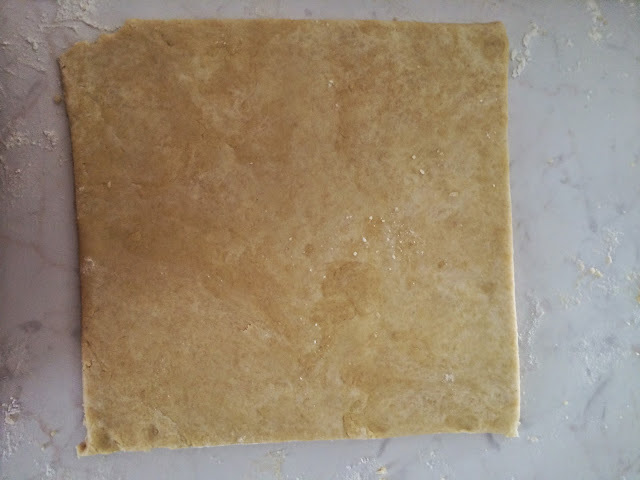 3) Place the pastry onto a floured surface, and roll out to about a 10 pence in thickness. 4) Taking a sharp knife, cut out a rectangle, so that the shape is even. 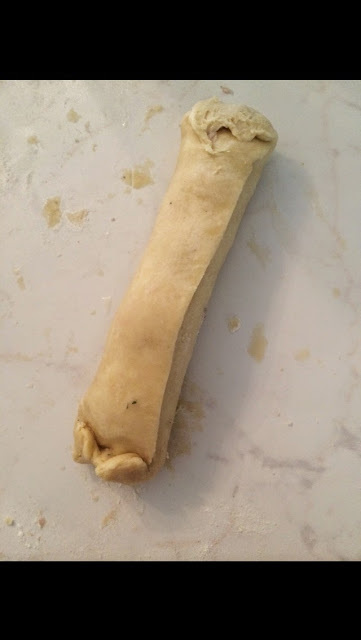 Then take your sausage meat and place along the left side first. Taking a brush and some water, slide across the edges to keep them shut. 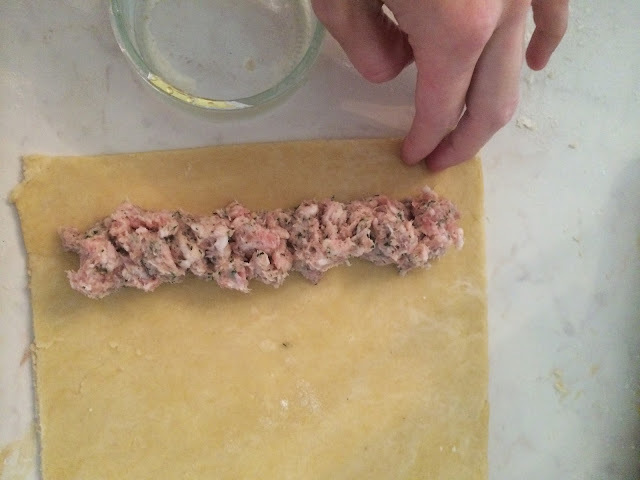 Then roll your sausage rolls up and pinch along the closed area to keep it shut. 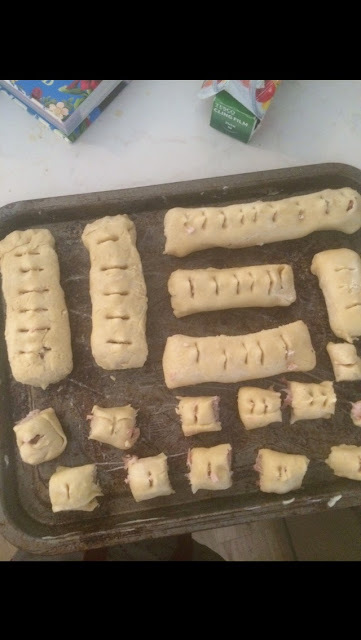 5) Now close the ends of the sausage rolls by pinching and folding away any thing that isn't neat. Then place onto a greased baking tray. Repeat steps 3,4,5 until you have used all the pastry. 6) Now taking your scissors cut little slits along the top to let the heat get into the middle for baking! 7) Finally Glaze the top of the sausage rolls with water or you can use milk/egg, to add a glossy effect and bake for about 20-30 minuites! 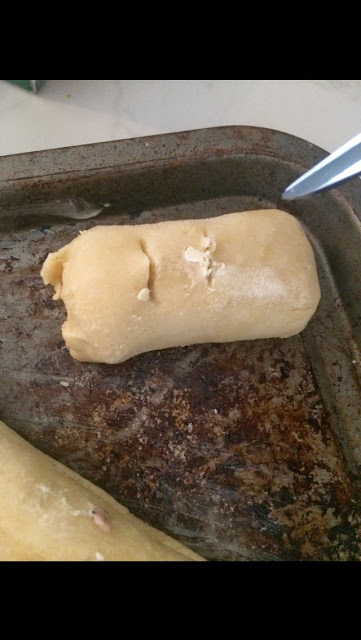 Or until perfectly flaky! 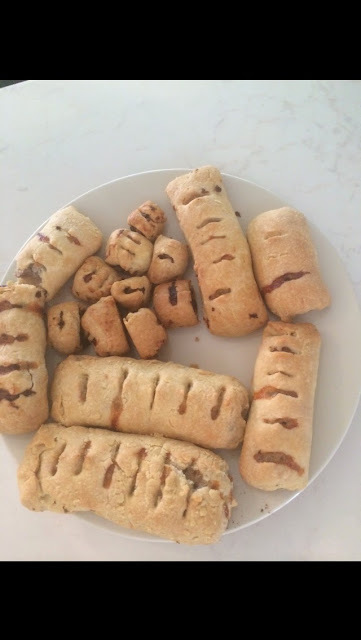 When mine came out of the oven they hadn't gone flaky at all and just tasted like a sausage inside a jam tart sort of thing!? I believe I made short crust pastry, and not flaky, but they still tasted ok! 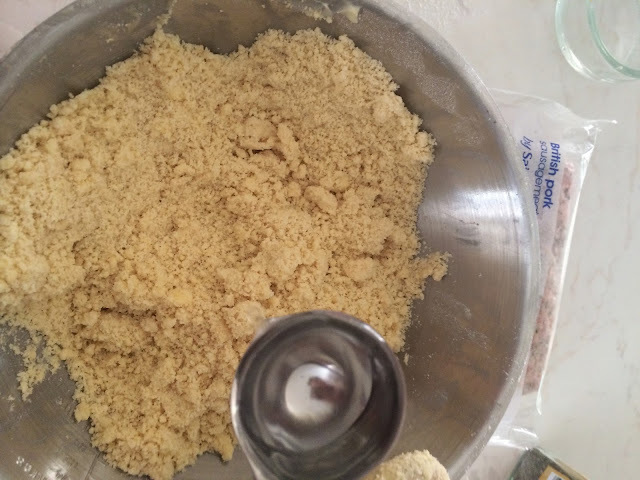 I hope you guys liked this simple recipe because it really is easy! If you try these out feel free to send me a picture on a social media site, and leave a link in the comments!